WORK IT! May 6, 2013. I still haven’t quite caught my breath after a week of constant go-go-go! From the start of last week up until today, there has been a constant stream of events, happenings, decisions, and occurrences that have left me a bit shocked at all that can happen within a span of seven days. Tuesday was spent at the good old day job, editing, writing, and helping design the upcoming issue of Ladies Magazine. We’re focusing on the June and July concepts and trying to build our team, which seems to be a lot more difficult than you would expect. With so many talented designers, models, stylists, and writers in the field why does it become so difficult to find someone with the ability to execute those skills into a working model? It would be ideal to find an editorial assistant along with a new stylist and photographer but hey, we’re still on the hunt. From work, I enjoyed a favorite meal of Korean BBQ with some fantastic company; Ritchie, mi madre, Duncan, Tom, Noon, Alex, Lea, and all. The whole experience of melting full sticks of butter on a sizzling skillet and grilling ribbons of succulent seasoned meat to perfection while stirring a vat of bubbling soup with a group is one that is new to me since moving to Cambodia, but hope to experience time and time again. Doesn’t beat a good fondue experience, but there’s something quality about community dining. Wednesday rolled around with a morning spent at home (thank you International Holiday!) then trotting off to NRG Studios for Glamazon rehearsals from 4:30 til about 9. It was definitely a time to start gearing up for the show and was a delight to finally meet all the models (both transformation and avant garde) along with Jujubee (yes! from RuPaul Drag Race) and get to see Ryan and Brandon, the event organizers and creators, along with Jeremie, Rachel, and Yulia in action. That evening, someone had gotten in touch with me regarding a new magazine that will be launched in Phnom Penh, hopefully in July and asking me to join the team as the Managing Editor. After learning more about the project, I decided to accept the proposal and found myself once again working on one more thing! Thursday proved to be the biggest day of the week for a number of reasons. The morning began with an interview with the an advisor of one of the big financial players in Cambodia (top 3 businessmen with a monopoly on…almost everything) for a magazine with pretty yellow borders. I’ve been fortunate enough to work with a fantastic journalist and teammate during the process and look forward to moving forward in the venture with him. I have no doubt that he will continue to teach me and guide me and look forward to anything we get to work on together in the future. 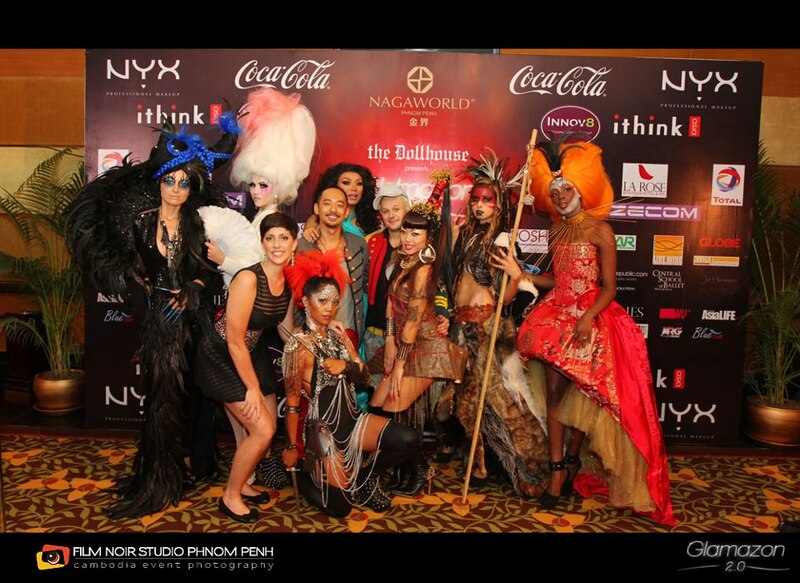 From the interview I went straight to Naga World Casino at noon for several hours of intense Glamazon prep. Glamazon is an extravagant event created by The Dollhouse and stems from the desire to showcase a top-quality show with haute couture,extreme makeovers,live performances and an over the top avant garde show while benefiting a selected charity. Due to the overwhelming positive feedback from last year’s Glamazon – A feast of extravagance , this year we are going bigger and more fabulous! Glamazon 2.0 – Too much is NEVER enough!! will be featuring our very special guest,Hollywood reality TV star – Jujubee, star of Rupaul’s Drag Race. Also featuring, live performances by Phnom Penh Central School of Ballet, Rhiannon Johnson, PPSS and new collections by Juli Handayani and Keok’Jay. From noon til 7:30, the models, designers, stylists, and everyone in between were non-stop organizing, prepping, and setting up for the event with a fervor I had only seen on television. The makeup done by Brooke Scobie of Kitty Demolition (a genius with a blush brush) and hairstyling from Ryan Drewe Taylor (like an awesome Edward Scissorhands) area literally looked like an artist’s studio with tubes and pots and vials and jars of every color imaginable and suitcases full of synthetic hair and wigs scattered among six inch tall heel-less pumps, pizza, and many a studded accessory. Getting in and out of our outfits proved to be a sweat inducing process itself and once you were in, there was no getting out. Donning an alligator skin Red Sonja inspired corset with leather thigh high boots with a heavy, foot tall hairpiece definitely makes every day functions a lot more difficult! Add three inch blood red gel nails and there literally is no going to the bathroom without assistance. I couldn’t complain though, three inches was nothing compared to the spiked six to seven inch nails some of the other girls had been wearing since THE NIGHT BEFORE. Cha’Nails did an amazing job on the talons and proved that they not only can do fresh tips for daily wear, but take things to insane lengths for the sake of fashion. The show finally began at 8:20 with 600 people in a vying audience. We could feel the energy building from backstage and from Jujubee’s first performance of Demi Lovato’s Heart Attack to Rhiannon Johnson’s gorgeous crooning to the train of models, transformed from every day to completely fierce, we could tell Glamazon 2.0 was a total success. When the avant garde models started making their way down the runway to the thumping beats from Dan Beck of KIMCHI Collective, the gasps, hoots, and cries of delight from the audience let us all know they were getting even more than they had bargained for. The overall impact of each character from Joan of Arc to Marie Antoinette to Eve to Cyndi Lauper was jaw dropping and the amount of care and detail that went into each piece was awe inducing. From that moment on until the minute I finish this entry, I feel like I’ve been running on adrenaline that has allowed my usual lounge-happy self to forge through multiple projects while maintaining long hours out and about, multiple whiskey colas, early morning pho runs, and still manage to have time for the important people in my life. During times like this I’m especially grateful for my mom and Ritchie, as their unwavering support and appreciation push me to continue to work harder, more diligently, and to never lose passion. Their criticisms always come from a place of true care, which only makes it all the more effective and important and their own personal successes are a pillar of what they stand for. As each day passes and life only continues to get more golden, it’s clear that they are where they are because of who they are and that the people who are fortunate to be in their lives would be smart not to forget that. I couldn’t be prouder of them both as the second half of the year comes close and can only imagine where the next seven months will take us all. I’ve got a feeling that things have taken a route that will leave me scrambling at times with dark circles under my eyes and not enough desk space to stay organized, but if it’s anything like this past week, I am totally okay with that. Thanks so much for everyone who have and continue to make this time of my life such an unforgettable adventure, I can’t really express what fun you make things for me and I only hope I can do the same for you. → Winging It. May 9, 2013.